This survey found dentists averaging 70 hours of clinical CE and 15 hours of practice management CE each year. “The minimum requirements are ridiculously low,” said one. 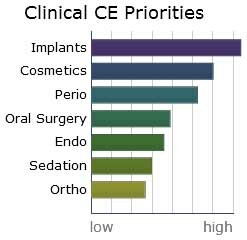 Doctors’ top priorities for clinical dental continuing education are implants, and cosmetics. Orthodontics and sedation dentistry were doctors’ lowest clinical priorities. Somewhere in the middle we find periodontics, oral surgery, and endodontics. The top dental management continuing education priority was team training, followed by leadership and office systems. Dentists appear less interested in education on technology and new patient marketing. “Unfortunately, in New York, CE credit is not obtained for practice management courses,” mentioned one dentist from that state.